You have gathered the best minds in the Dark Ages to your Guildhall. Can you advance the wheel of progress before the other players? In Guildhall players attempt to collect complete 5-card sets of profession cards in their Guildhall to form Chapters that when completed are exchanged for Victory Points. That’s about it! But each profession type endows the player with a special abilities depending on the number of that profession already in the Guildhall. These abilities allow players to steal, trade and search for cards from their deck and from other players! The more of that profession you have, the more powerful the effect. Once a player collects all five colors of a certain profession they complete that Chapter but lose that profession’s special ability. They can then use that completed chapter to purchase Victory Point cards from the center of the table. The first player to 20 Victory Points wins! The 120-card profession deck (four sets of six professions in five different colors ) is shuffled and placed in the center of the table. Players are dealt nine cards to form their starting hand. The Victory Point cards are shuffled and one at a time, five of these cards are dealt face up in a straight line. This is called the “center row.” A first player is chosen. The first player then may discard as many cards as they like from their hand and draw back up to nine. Then, that player places three of those cards face-up onto the table to their right. This forms that player’s starting Guildhall. All cards of the same profession are grouped together and form a Chapter. Then, each player in turn completes this special set-up turn. The game is ready to play but first, let’s have a look at the Profession cards. The Assassin allows a player to discard cards from another player’s Guildhall. With 0 Assassins already in the guildhall, one card can be discarded. With 2 Assassins in the Guildhall, 2 different cards can be discarded but from two different chapters. With 3 Assassins already in the guildhall, any two cards can be discarded. The Farmer allows a player to earn Victory Point (VP) Tokens. With 1 Farmer already in the guildhall, the player receives 1 VP token. With 3 Farmers in the guildhall, the player earns 2 VP tokens. The Historian allows a player to place cards from the discard pile into their guildhall. With 0 Historians already in the guildhall, the top cards of the discard pile is placed in the players guildhall. With 2 Historians in the guildhall, the player looks through the discard pile and places any card into their guildhall. With 4 Historians already in the guildhall, any two cards can be taken from the discard pile and placed in that player’s guildhall. The Trader allows a player to swap cards from their guildhall with cards from another players guildhall. discard cards from another player’s guildhall. With 0 Traders already in the guildhall, one card can be swapped. With 2 Traders in the guildhall, 2 cards can be swapped. With 4 Traders already in the guildhall, an entire chapter can be swapped. The Dancer allows a player to draw a number of cards equal to the number of other Dancers in their guildhall. Then take another action. The Weaver allows a player to exchange cards between their own hand and their guildhall. With 0 Weavers already in the guildhall, one card can placed in the guildhall but no cards are returned. With 2 Weavers in the guildhall, exchange 2 cards from the hand with 1 from the guildhall. With 4 Weavers already in the guildhall, any number of cards can be exchanged with 2 cards in the guildhall. Now we know what the Profession cards can do, let’s dig into the gameplay. A player plays one card from their hand into their Action area face up and uses its ability. A player cannot play a card of a given profession and color if that profession is already in their guildhall. And a player may not play two cards of the same profession in the same turn. After the player activates and uses the card’s ability (based again on the number of matching profession cards in their Guildhall), that card remains in their action area until they complete their second action. A Player can discard any number of cards from their hand. The cards can be placed on the discard pile in any order. Then the player and draws back up to six cards. A player may discard completed chapters from their guildhall to buy one Victory Point card from the center row. Chapter icons on the top of the card denote the cost of the VP card. The large number on the VP card is the number of Victory Points awarded to the player who has claimed it. And some VP cards have abilities that trigger immediately when bought. The empty space in the center row is then filled by drawing the next card from the VP card deck and pacing it face-up in the center row. When the player has completed their two actions and all effects have resolved, all the cards in the player’s action area are moved into the guildhall and added, if possible to an existing chapter. Gameplay continues until one player’s Victory Point total reaches 20 or more and they are declared the winner! As with all AEG releases, the game art by Mike Perry is excellent. The cards are sturdy and the multi-lingual rulebook is organized and well written. The iconography and graphic design give the game a nice “euro-feel.” Upon opening the 9”x 9” box, and removing the rules, there was mostly plastic, air and two deep cubicles for the cards and VP tokens. It’s a bit of waste of space (sales and marketing considerations aside) especially since the cards almost fit completely into the compartments. Even with the rules, the top most cards slide around inside the box. Argh! Moderate. The game play is amazingly simple. In striving to be language friendly, icons are used on the profession cards to denote their specific game play effects, and it does take a bit of time to know what these icons mean at a glance. Once learned however they are easy to understand. In addition, multiple strategies emerge later into the game and require several plays to master card effect combos. While not overly taxing, it may give some players pause. There is no reason NOT to introduce this game to a family game night with older children. The interaction and game play is excellent. The iconography may be a little tough for younger children though. It depends on the maturity of your 10-12 year old. Try it! This is not a party or social game so you’ll have to look elsewhere to scratch that itch. Guildhall offers an interesting mix of random elements and hand and discard strategy. Being able to spend actions to manipulate the discard pile as well as your hand creates for a less random and more strategic feel. Still, it’s a draw and play card game. Strategy gamers may not dig it. Fast and fun to play and great for non-gamer gamers too. Quick set up and great emergent player interaction creates many game play outcomes. It may be a bit cutthroat for some but for the most part it’s an easy choice for the casual player. The tactical choices created by the dual use of the profession cards (an ability engine in the guildhall or resources to buy Victory Points) in addition to some intense player interaction create a compelling hook for the avid gamer. Dive right in! Guildhall doesn’t offer the competitive strategy and focused game play that a Power gamer would expect. Some dominant strategies may also emerge after several plays with the same game group. Power gamers may want a game with a little more control. With original design by Hope S. Hwang, Guildhall introduces a few card game elements that are fresh and fun. Though the game is basically a set collection card game, the professions deck is designed in a way that so that four players will be able to (with a little luck) create their chapters regardless of the other players. Unlike most trick-taking games where all available cards are split between the players, in Guildhall, there are four complete sets of all six professions, so the availability to create chapters (sets) and utilize their special abilities is much more attainable. Players are free to pursue their own strategy. However that accessibility can work against you and your strategy may not be long lived. So many cards mess with your guildhall that often times card play is more tactical: reacting to the other players’ turns when your turn comes around again. A unique quality of the game is the crucial decision a player must make when deciding to go for VP instead of utilizing the abilities of that profession card. All of the profession cards’ abilities hit their stride when a player has two of the same profession in their guildhall. For all but one of the professions, their major ability kicks in at four. With the Assassins and Traders running around, getting to four is difficult. (and here the game can get a bit cutthroat). In most cases, the only way to use that highest level ability is to play the matching profession, which of course completes the chapter and flips it – effectively losing that special ability. Players must constantly balance their desire to manipulate cards in play using abilities with the decision to trade those chapters for VP. And it all comes down to Victory Points eventually. There can be motivation for going for Victory point cards. Some of the cards have special abilities that kick in when purchased; including a 2-point VP card that allows you to outright put a chapter from another player’s guildhall into your own and a 7-point VP card that lets you take 2 more actions. It’s like wishing for more wishes! The game is incredibly balanced. As a player, you can feel it from the start. This comes from the game play choices available. The turn actions allow a player to manipulate cards in hand (discard and draw), which should be the primary focus of any trick-taking game. The special abilities of the different professions allow the rest of the play areas to be toyed with: The Trader affects cards in players guildhalls; the Assassin sends cards to the discard pile; the Historian moves them from the discard to a player’s hand; The Weaver sends them from hand to Guildhall and so forth. The Dancer feels like the more powerful card granting card draws and an additional action. In games with more than two people, there never seems to be one player who is running away with the game because of this multi-faceted structure. The use of the icons give the game a unique, almost “euro” feel; perhaps the influence of Jeff Quick (Hero-clix and Thunderstone) who developed the game for AEG. All in all, the game is accessible, but challenging. With a high replay value due to the randomization of the VP cards, Guildhall will find a place in most players collections. This game can be a bit cutthroat at times, so if you’re a player that doesn’t like to get too confrontational, you may not enjoy it to its fullest. But hey, it’s all in good fun when it comes to progress! Be sure to check out the expansion: Guildhall: Job Faire! Progress! That’s what these Dark Ages need, someone with a little get-up-and-go. You’ve been a serf in this one-pig town long enough, and it’s time to shake things up. You’ve opened a guildhall for like-minded professionals from all over Europe to work together, build their trades, and get some economic stability. Well, you’ll just have to do it faster than those other guys! Gather professionals into chapters, and use their combined might to reach for victory. Collect complete color sets of professions (all five colors of Trader, for instance), which you use to buy victory points (VP). The first player to gain 20 VP on her turn wins. In Guildhall, each profession grants you special abilities, and these abilities grow stronger the more of the set that you complete. When you cash in the set for victory points, however, you lose the ability until you can build it up again. Which professions are worth risking VP to keep? Sunday night is game night at the Gamer Bling household, with the Gamer Bling Official Companion, Gamer Bling Expansion #1, and Gamer Bling Expansion #2. Each one gets to choose the game of the week in rotation. Recently, that game was Guildhall, as chosen by the Gamer Bling Official Companion. And thus we are promised the opportunity to grow and thrive whilst in competition with others. Sounds pretty euro, doesn’t it? And it is. As an aside, the main spokesman for the game, sitting front and center on the game box, is a gap-toothed, bald-headed, knob-nosed pig farmer, happily holding two little pigs. You’d think he would rather be holding the dancer’s puppies, but to each his own. And by puppies, Gamer Bling of course refers to the two cute dogs at the dancer’s feet, which were sadly cut off when the art was laid out. Gamer Bling knows these things. Regardless, it’s pretty brave to have such a homely guy be the face of the game. And he’s as close as the game gets to the actual plague-ridden, flea-infested, contaminated-water Middle Ages. Which is just fine by Gamer Bling. The rest of the game is as clean and smooth-flowing as a mountain stream. The game box is filled primarily with air, especially if you get one of the first-printing boxes before they renovated the storage system. 150 cards, one punchboard, rules. That’s it. It is sad that games must have a large footprint in order to be seen on retail shelves. However Gamer Bling hears that the new improved storage tray inside second-printing boxes is much better, and will be able to hold the inevitable expansion as well. * Play a card to your action area (it cannot match a card already in your guildhall, or be the same profession as a card you already played this turn). * Discard as many cards as you like and refill your hand to 6. * Buy a VP card (many have abilities you get when you purchase them). Then, at the end of each turn, you sweep cards from your action area into your guildhall. Shazam! Even the Gamer Bling Official Companion, who is usually good for at least one accusation of skipped rules explanations, picked this game up with no hard feelings whatsoever. Gamer Bling was pleasantly surprised, this being, as near as he can recall, a first. There are six different professions in the game, each of which appears in five different colors. Each of the professions has a unique ability, and the power of this ability grows as you gather more of that profession into your guildhall. For example, the first farmer you play scores you nothing. If you play a second farmer (one already being in your guildhall), he scores a VP, as does the third. The fourth and fifth farmers score 2 VP each. Once you collect all five colors of a given profession in your guildhall, that chapter gets closed (flipped over), and you can use it to buy a VP card. Also, your guildhall is now empty of that profession, and you can play more of that card. The game design is both brilliant and elegant for this one reason: You can only have one of each color in your guildhall. As the number of cards of a given profession grows, their power likewise grows, but your chances of playing one of the remaining colors diminishes. Thus, as the game goes on, you are often looking for ways to sluff off people already in your guildhall so you can play that duplicate in your hand, or else find some way to trade for that last card you need. It plays quickly, with the turn sometimes flying around the table. You have to take time to score points, which is always clever. And although there is a bit of spite, it is fairly light and easy to recover from. Usually the spite is incidental to getting your own chapters closed. The only downside is that sometimes you can tell that a given player will win on his or her next turn. Sometimes you can stop it with a dash of luck by buying up VP cards, but usually not. That said, the game progresses quickly enough that even with four players, this last gasp to stop a win lasts only a couple minutes. Color-matching games–or in this case, color mismatching games–are problematic for the colorblind, but AEG handled thus very nicely. Each color has a unique texture, as well as a set of three symbols each tied to one color. Thus even those who are completely colorblind can mix and match the crosses, fleurs-de-lis, etc. In addition, each profession has a little signpost in the upper left hand corner with a unique icon. Thus even a small fanning of cards shows you what you have as far as professions and colors. Finally, each card has clever iconography to explain its use. This means that the cards themselves have no language dependence. Obviously, you need to have someone teach you the rules, but the Gamer Bling Official Expansions (aged 10 and 12 when they first played) picked up the game functions very quickly. As a homeschool parent, Gamer Bling believes in seizing every opportunity for learning. Here’s what the kids can learn or practice with Guildhall. Complex problem solving: Given a set of diverse cards, players must find a way to maximize their benefits by stringing together simple tasks. Even with a mere six professions, the options explode exponentially. Gamer Bling believes that this encourages independent thinking (as opposed to rote methodology) which leads to creativity and success. Likewise, the realization that your assets (cards in your guildhall) may be impeding your options (cards in hand) is a useful life skill. Iconography: Perhaps this is a reach, but Gamer Bling Believes that exposure to iconography expands understanding of iconography. This coming from a guy who spent many years of his childhood thinking that the Handicapped Accessible sign (the dude sitting in a wheelchair) was a icon for a guy sitting on a toilet bowl. Because Yours Truly only ever saw them on restroom doors. It is a regular in the rotation at the Gamer Bling table. Just check Gamer Bling’s stats for games played. This was an instant hit in the Gamer Bling family. And it plays fast, which means we can get in two games in an evening. Double the winners! And thank you for taking the time to read a Gamer Bling Sunday Night Review. I really do enjoy this game. I first played it with a customer in the FLGS I work at after a shift. He gave me a quick run down of what each card does, the actions available on your turns, and what you needed to do to win. Within a few minutes of opening the box, we were off and playing. Discard cards and redraw up to 6. Buy a Victory Points card. After playing cards to your action area they are placed into your Guildhall. If you’ve made a set of all 5 colors of the same card type, you “close the chapter” and flip the pile over. Play continues with players taking their turns until one reaches 20 Victory Points. Strategy comes in very quickly. Card effects get stronger the more of the same you have in your Guildhall, but you cannot play duplicates, so playing the last one or two you need is hard to come across. Sometimes you will give swap cards to other players Guildhalls so you can replay one from your hand. Sometimes having a couple of your guys assassinated isn’t so terrible, because you’re holding spares in your hand. Turns can go very quickly, and can sometimes take a while. I’ve played four player games with experience Guildhall players that took 20 minutes, and ones that have taken 45. There’s some spite moves in the games, and some quite fun “Ah Ha!” moments that keep things fresh. The game sets up really quickly as well. A quick shuffle of two decks, pass out some cards, and get started. Overall, this is a game that I have a lot of fun playing every time it hits the table. I play it whenever I get the chance to, and it’s usually ready and waiting in my car. It’s a game that quick to teach and great to play, and so I never let it be too far away. If you’re ever in my store, ask me to play. I’m always ready to show how much my Guildhall is better than yours. 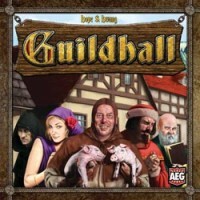 Guildhall (retroactively named Guildhall: Old World Economy in AEG’s marketing materials since they released the sequel, Guildhall: Job Faire) is a card game of strategic set collection for 2-4 players. Players must take turns to attempt to complete Chapters (one of each of five colors) of Professions (cards with different abilities) within their Guildhall (individual collection area), then cash in those completed Chapters for cards which bestow Victory Points (and sometimes, additional abilities) in a race to attain 20 points. – Play a Profession card from hand into their play area (but not if they have played the same Profession already this turn), and resolve an ability on it if desired. – Discard any number of cards from hand and draw back up to six cards. – Cash in an appropriate number of completed Chapters (one or two) for a visible VP card. You may only play a profession card if it does not match both the color and type of a card already in your Guildhall. Profession cards are put into a play area at first, which is not your Guildhall, and their abilities are resolved. Any cards which are placed directly into your Guildhall as a result of ability resolution do not resolve their own abilities — at most, you will resolve two Profession abilities per turn if you used both of your actions to play cards. If you complete a Chapter (have a stack of all five different colors for a single Profession) during your turn, you turn that stack face-down immediately; it is considered to be “completed” and can no longer be affected by opponents. You can then begin a new Chapter of the same profession. At the end of your turn, any Profession cards in your play area move into your Guildhall (if possible), and any completed Chapters are flipped face-down. Completed chapters may be cashed in for VP cards from the communal line, some of which are worth only points, others worth a lesser amount of points but with an additional ability that resolves immediately. Most of these abilities are similar to those offered by the Profession cards. Once a VP card has been taken and resolved, it is replaced in the line from the top of the VP deck. Once a player reaches 20 VP, they are the winner and the game ends. Where Guildhall shines is the ever-changing state of play. You can’t rely on having a perfect setup once your turn comes around again, but you can use the off-turns to calculate the effect of what you are going to play. Certain Professions are strong in the early game, while others come into their own late in play. The random element to the VP cards allows for strategies which change on the fly, and can set off cascading effects. It is dangerous for a player to have too many incomplete chapters with 3-4 cards in them, as they will not be able to play as many cards from their hand; on the other hand, for an opponent to ignore a loaded Guildhall is also dangerous, as that player could complete many Chapters with a single action. As a two-player game it has a high entertainment value, a constant back-and-forth struggle to win. With three or four, the amount of disruption and strategic play possible increases dramatically. At no point during my play has it ever felt like someone was running away with a game — even those where someone comes dangerously close to winning early can be thwarted by some late-game maneuvering and well-timed Farmers. Also, the VP cards’ values are scaled to the power of their ability, so that highly effective moves come at the cost of not advancing your position as much. The game’s visual design is well done: cards of different colors also have different border elements, so they can be distinguished from each other in multiple ways. All of the abilities on the cards are represented with iconography, meaning that the rulebook must be referenced for deciphering if people don’t “get it” easily. The box is an exercise in overpackaging — it is 9×9 apparently to occupy a certain amount of shelf real estate (and presumably draw attention to the game) and to support an oversized multilingual rulebook, with a large plastic insert containing a single tray for cards and tokens. The entire game minus rulebook can be repackaged into a small (200 count) card box, which is a bonus for portability if you like to take multiple games to gatherings. Guildhall is simple enough to teach to young players or non-gamers — as a personal anecdote, my 70-year old non-gamer mother took to the game well, after a small learning curve for how the abilities worked. Some of the rules may take a session or two to fully commit to mind, such as the play area vs. the Guildhall, and the “no duplicates” rule. Games run reasonably quickly, about 30-45 minutes, and it takes very little time to set up or put away. Since it is based around set collection, it is a game type that others should grasp easily. The varying strategies — and the fact that no particular strategy will work the same way between two games — lends a complexity that makes the game very replayable. All in all, the game is fun to play. It won’t immerse you in theme, and it won’t give you a power-play high, but if you enjoy casual games or like teaching games to new people, Guildhall can easily earn a spot in your game library. I have this game and for me it is a great filler. Guildhall is a card game based on card combinations so you can activate special powers. In order to activated these powers you have to combine a certain number of cards of the same type. Other players can (and will) try to deny you these combinations. When a combination takes place an opportunity to buy VPs appears and you have to go for it in order to win the game with the most points achieved. The theme involved is very superficial and you don´t have much of a feeling of being assembling a Guild of people. Regarding the components they´re very simple but nonetheless well designed. Lots of strategy involved and card combination. With four players this game became too long and too boring because of the amount of interference that players can (and will) do with others players actions. With 3 players the game will be very loose so everyone can play without the AP in every single turn. I recommend it only for a 3 players game. Guildhall wasn’t as intuitive as we would have liked, but it was a fun play. It took my group a while to get the hang of what all the symbols meant and how many cards down gave you what. But by the end of the first game we all had a pretty good handle on it. Most of the group wasn’t that impressed. (Most thought the card worth 9 victory points was overpowered.) I really enjoyed it though. My advice would be to play a few times before you make a final decision as to if you like it or not. It’s a fun time! Add a Review for "Guildhall"